Lachie Stewart – the most famous athlete to wear the read and white hoops. The Vale of Leven AAC was established right after the Second War and it was not long before the red and white hoops were recognised all over Scotland. Their officials were very good and it was the infant Vale club which was the main instigator of the Dunbartonshire Amateur Athletic Association with letters being sent out to all the other clubs in the County – Clydesdale Harriers, Dumbarton AAC and Garscube Harriers and the Association was born. In the 1950’s they produced runners such as Alec McDougall who ran in the Commonwealth Games as well as in the International Cross-Country, Pat Moy twice an internationalist in the ICCU Championships, Walter Lennie who won the West District and was a noted track runner before he moved to England and Willie Gallagher. Since this section is about the men who qualified as members of the Fast pack, we will look at the men individually but the club record bears looking at first. They seemed to be able to get their best men out on the Roads more often than over the country so we will start with the Edinburgh to Glasgow relay over the 1949 to 1963 period. They dropped out of the race in 1964 so it is quite a discrete time span. November 1949 6th Macpherson 6, McDougall 7, A Campbell 7, J Malcolm 5, H Coll 5, Gallagher 5, Lacey 5, Crowe 6. The star beside Pat Moy’s time in 1955 indicates that he had the fastest time on the stage, The three stars each represent a missing runner in 1963. Hughie McErlean in 1963 arrived at the changeover to find that his man (Alec McDougall) was not there and Hughie ended up running over the next stage and the club was disqualified. The good news is that the new club won the most meritorious medals in their first run in the event, the first post-war race, in April 1949. All in all it is a quite remarkable record of consistent high performance at a time when the sport was thriving and from a team in a very limited centre of population and with no drawing power for athletes in surrounding clubs. Over the country their successes were more spasmodic, largely because they seemed to find it more difficult to get the top team out. Between season 1949-50 and season 1960-61 they only finished a complete team in the National Championships once. This was despite having several outstanding men in the club at the time. The complete team was in ’49/’50 when Willie Gallagher was thirteenth leading the team into eighth place. Thereafter the record was – 1950/51: no runners but Alec McDougall was fifth in the Junior National; ’51/’52: No team or runners; ’52/’53: No team or runners; ’53/’54 No team but F Lacey was an individual and Willie Gallagher ran for Shettleston finishing eleventh but was not a counting runner for their team; ’54/’55: No team but Jimmy Garvie was ninety fifth; ’55/’56: an incomplete team but Pat Moy was seventh and Alec McDougall twelfth with Hugh Garvie and Jimmy Garvie in 62nd and 71st; ’56/’57: another incomplete team with Moy in fifth, McDougall in ninth, Jim Garvie 51st, Ian Young 83rd and Hugh Garvie 112th; ’57/’58: Moy tenth, McDougall eleventh; ’58/’59: McDougall twenty fifth, Jimmy Garvie 55th and Willie Gallagher 61st; ’59/’60: Moy 24th, H Garvie 125th, and in 1960/61, only Alex MacKay and Hughie McErlean ran and both finished outside the first 100. When it came to the event itself on 23rd November in a mucky Pollok Estate in Glasgow, the report read: ” In the team race, Vale of Leven very wisely had their counting four runners running as a unit and they well deserved victory with the low count of 51 points beating eastern rivals Edinburgh Southern Harriers by 17 points.” The runners and their positions were Getty 11, Cole 12, Campbell 13 and Gallagher 15. On the facing page was a special article about the club. Yes – the Vale of Leven AAC, winners of the National Novice Team Championship at Pollok Estate on 23rd November 1946 – was only formed in 1945. And Bellahouston Harriers can make another claim of service tio the sport, for their well-known member from the “Vale” Jimmy Gardner, was the prime mover of the formation of the Vale of Leven AAC, which was officially started on 5th September 1945 at a meeting held in the pavilion at Millburn Park, ground of the Vale of Leven FC. The remarkable jump to the forefront in just one year was accomplished with enthusiastic perseverance of the team, with the encouragement of their hard-working secretary, Willie Stevenson, and the experience and sound training methods of their coach and Maryhill Harrier Archie Peters. Archie took the boys out from Levenvale School on Tuesday and Thursday evenings and the pack covered distances varying between three and five miles. Emphasis was placed on steady pacing and anything in the nature of racing each other was ‘taboo’. Fast starts were indulged in at appropriate times with a gradual building up of pace over the rest of the distance. The training trails can be claimed as the most beautiful in the world, for their training runs are long ‘The Bonnie, Bonnie Banks o’ Loch Lomond’, and on Saturday afternoons for their cross-country runs they traverse the hills that overlook the picturesque Rob Roy country around Drymen. Their club novice championship was won by Alex Campbell but he was only ten yards ahead of J Getty another ten yards ahead of Willie Gallagher third. The last mentioned by the way is a brother of ‘Skeets’ Gallagher of boxing fame. Prominent people of Vale of Leven district have a keen interest in the club’s activities and it will be recalled that Sir Ian Colquhoun, Bart, DSO, of Luss, formally opened their sports meeting at Millburn Park last July. Mr Hugh Craig JP is Honorary President f the club and, amongst other benefactors, are Miss Millar-Weir who presented a silver cup for the club cross-country championship, and Mr E Hofstedder, a Swiss consul and resident of Balloch, who has given a trophy for the club novice championship. The Vale of Leven officials are expecting a big increase in club membership. Their club has done much to foster athletics in the “Vale” . Their winning team is an inspiration to local youth. Just to add a bit to the story of the founding of the Vale of Leven, Willie Gallagher, of whom much more later, says “I first took an interest in running when I was sixteen. Track running. No running club then. I contacted two old runners, Jimmy Gardner and Willie Stevenson to get the Vale of Leven AAC started.” And there’s the story, Willie was a track runner without a club, he approached men he knew had been runners and the club was born. In January 1947 the club were seventh in the Midlands District Championship with their first runner home being seventeenth, and then in the National, there was no team at all. Came November and there was no team in the McAndrew Relay and in the National Novice Championships they were sixth with Walter Lennie, their best performer over the winter, second finisher but their close packing of the year before was not in evidence with placings being 2, 27, 52 and 68. They were eighth in the District Relay on 6th December with, Walter Lennie eighth fastest. In the District Junior Championships on 7th February the club was eighth again with the top runners being Lennie in second and F Lacey in fourteenth. In the Youths race that afternoon, Alec McDougall was seventh. Came the National – and there was no team from the Vale of Leven although there were three finishers in the Senior team – F Lacey was seventieth, T Wilson just outside the first hundred in 101st and M Connell 146th. Alec McDougall was 73rd in the Youths race. In the McAndrew Relay on 3rd October, the Vale had three teams out with the A team of W Gallagher (16:32, A Campbell (16:51, GF Lacey (17:24) and W Lennie (16:02) finishing fifth, the B team 22nd and the C Team 41st. Lennie had the third fastest time of the day. In the National Novice on 20th November the team was sixth with the runners being A McDougall 14th, W Crowe 46th, D Macpherson 49th, M Connell 88th plus J McNabb 85th, E Murphy 113rd and runners in 162nd and 212th. Into December and on the fourth, the team was fifth in the Midland Relay with Lacey 16:25, H Coll 15:32, W Gallagher 15:21 and W Lennie 15:17. They had a B Team out which finished twentieth. On the 5th February in the Midland 7 Miles Junior Championships, the team was eleventh. Willie Gallagher led the team home with a good fourth place only half a minute behind the fastest man who was the remarkale John Joe Barry. Other Vale runners were T Wilson 67th, D Macpherson 75th, A Campbell 76th, W Crowe 86th, H Murray 129th. It had been a very good winter by any reasonable standards but when the National came along – no team from the Vale was on the starting line. Willie Gallagher ran and finished eighteenth, Jim Gardner was 118th and M Connell 129th. The first of the post-war Edinburgh to Glasgow Relays was held in April and the team was eight with F Lacey running the first stage and finishing fourth before A Campbell dropped back to seventh on the second stage. D Macpherson lost another place on the third stage and M Campbell another two on the fourth. Alec McDougall had a very good run – third fastest of the day – to bring the team up to eighth and that was held by W Gallagher, W Crowe and T Wilson. 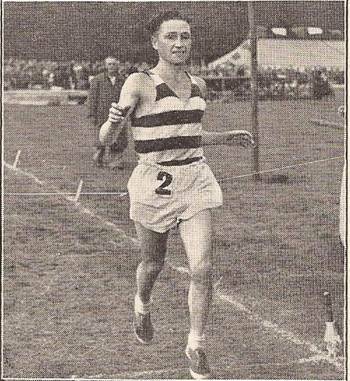 The best run by a Vale of Leven runner in summer 1949 was Walter Lennie’s second in the mile at the SAAA Championships at Hampden. In the preview of the cross-country season in the ‘Scots Athlete’ Emmet Farrell singled out W Gallagher as a bright young man and bracketed his chances with those of Bickerton, Tracey and Kidd. There were two teams out in the McAndrew on 1st October and the first team (Macpherson 16:47, Gallagher 16:37, Crowe 17:07 and McDougall 16:35) was eighth with the B team of Wilson, Coll, Campbell and McNabb thirty ninth. On the 15th in the Dunbartonshire 10 miles relay championship the team won from Clydesdale Harriers. Macpherson ran first and was timed at 13:16 before Willie Gallagher took them into first place with 12:38. This position was held by Alec McDougall in 13:03 and Walter Lennie in 12 minutes exactly – “the most brilliant running was reserved for the last leg” said the Scots Athlete. On 2nd November the second Edinburgh to Glasgow was held and the team improved to sixth by the finish. D Macpherson was sixth on the first stage, Alex McDougall on the second handed over in seventh to A Campbell who picked up to fifth with the third fastest time of the day. J Malcolm held fifth. and did H Coll, Willie Gallagher (third fastest on Six) and F Lacey with Willie Crowe being shunted back to sixth on the last stage. On 15th December 1949, in the Midlands Relay the club was third with very good running all round – D Macpherson (15:08), Willie Gallagher pulling the team from ninth to second with a time of 14:30, Alec McDougall dropping back with 15:01 and then Walter Lennie coming back up to third with 15:10. Lennie was second fastest equal with Tommy Tracey (Springburn) and Gallagher was equal fifth with Jim Ellis (VPAAC) and Clark Wallace (Shettleston. Into 1950 and on 4th February, in the Midlands Championship Vale of Leven provided the winning runner in Walter Lennie with Willie Gallagher eighth and the team was fourth. This time they did put a team forward in the National and it finished eighth with Willie Gallagher eighth individual. Walter Lennie was probably one of the best runners in Scotland never to have run in the Edinburgh to Glasgow or Senior National Cross-Country championship. He was a stand-out in short relays, a first-rate track runner and good enough over six and seven miles to win gold and silver in the Midlands Championships. If we trace his career through the ‘Scots Athlete’ magazine we can start with the District Relays on 6th December 1947 when the the team was fifth and he himself was eighth fastest over the course. It should be noted right at the start that this was a time when the standard in Scotland was very high and there was tremendous strength in depth across the country. Victoria Park, Shettleston Bellahouston and Springburn were probably the best teams in the country although possibly Edinburgh Southern Harriers could justifiably be a bit irked about being left out of the top four. We can start with the Novice Championship on 22nd November 1948 at Pollok Estate in Glasgow. The report read: “There were over 200 starters. When the “field” came into view approaching half distance, only D Jackson of the “fancies” was “in the hunt”, and then he seemed to falter badly and had to retire, as Garry did also with leg injury. A group of four, all running sweetly were out in front with C Forbes (Victoria Park) leading, followed by W Brown (Edinburgh Southern) and D McLachlin (Springburn) whilst J Duffy (Garscube) seemed to be content in fourth position. With a timed effort, Duffy forced the issue with just over a mile to go and his company could not respond. But W Lennie (Vale of Leven) who had been closing up gave chase. Over the last mile, Lennie gradually closed in a ten yard gap, and about 200 yards from the tape actually passed Duffy. In an uphill gradient to the finish Duffy rallied and his strong finish was too much for the weakened but gallant Lennie.” The result was 1. J Duffy 26:34; 2. W Lennie 26:44; 3. W Brown 26:50; 4. C Forbes 27:22. 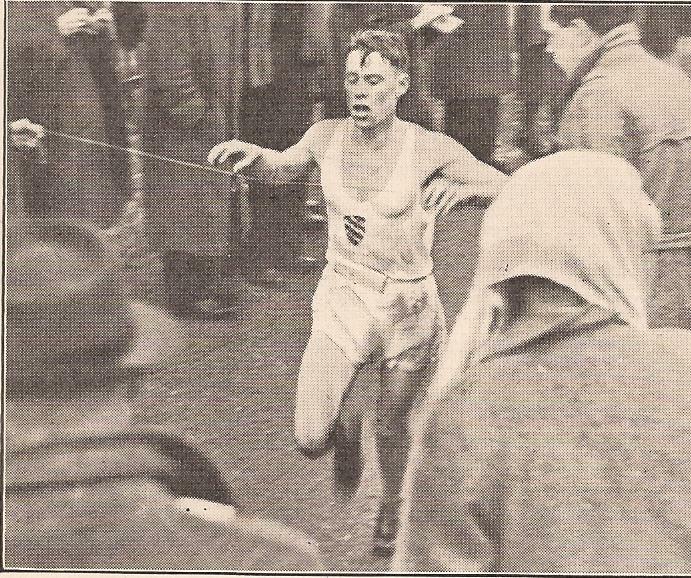 In the Midland Championships proper on 7th February 1948, on a day of heavy rain and strong winds, Lennie was second to Bobby Boyd of Clydesdale. The report in the ‘Scots Athlete’ of February 1948 read as follows: “With 13 teams and 10 individuals, the 3 laps providing an excellent spectacle for the onlookers. White and Boyd (Clydesdale) with Craig (Shettleston) led the field for the first lap, and on the second circuit being completed Craig was endeavouring to shake off the longer striding Boyd, followed by Kidd (Garscube), Lennie (Vale of Leven) and White (Clydesdale) leading a group close behind, and it was most striking how Garscube and Maryhill team members were “packing” well up and their finishing places given later are a perfect illustration of team work “par excellence”. At the finish Boyd, striding strongly through the tape, proved a worthy winner, and young Lennie with a fast burst got in front of Craig. These three are surely a promising trio for future honours.” Result: 1. Boyd 39:33; 2. Lennie: 3. Craig; 4. A Kidd (Garscube). Following these two races, Emmet Farrell in the March 1948 ‘Scots Athlete’ commented as follows, ” The small but neatly built Lennie is perhaps the most colourful newcomer of the season and looks one of the greatest prospects. Improving each time out, no one knows his full capabilities and even at the present moment he is within striking distance of international class. He looks like becoming a Scottish champion in the near future.” He did not run in the National in 1948 unfortunately. In season 1948/’49, The Vale of Leven was fifth in the McAndrew Relay and Lennie was third fastest over the course. For a young and relatively inexperienced runner to be right in among the stars of the day such as Emmet Farrell, Andy Forbes and all the top men from the other clubs was quite an achievement. On 4th December 1948 were fifth again and Lennie was again among the fastest times with his 15:17 for the two and a half mile trail. The following summer in the SAAA Championships at Hampden Park he was second in the Mile showing a clean pair of heels to more very good men on a totally different surface. He had in nine months shown ability over country, on the road and on the track. Into season 1949/’50 where Lennie missed the McAndrew Relay on 5th October but on 15th October in the first ever Dunbartonshire Relay Championship he had a wonderful run on the last stage. Willie Gallagher took the club into first on the second stage and the club was overtaken by George White (Clydesdale) on the third before Walter Lennie regained first spot. ‘The Scots Athlete’ report on the race remarked that “The most brilliant running was reserved for the last leg. And it was the 20 years old county mile champion W Lennie (Vale of Leven) who showed it. Taking the lead early on he left class men Bobby Boyd (Clydesdale) and Alex Kidd (Garscube) as if they were novices and was over half a minute faster than the next best.” The Midland Relays were held on 5th December and the young Vale of Leven club was third running their usual line-up of Macpherson (9th), Gallagher (an excellent run to bring the team up to second), Alec McDougall who dropped a few places and Lennie who picked back up to third. He had the equal second fastest time of the day with Tommy Tracey of Springburn. In 1950 he achieved possibly his best ever cross-country win when he took first place in the Midlands Championship which led Emmet Farrell to heap praise on him for the Junior National Cross-Country Championship with a fulsome write-up of “the brilliant Lennie” The article in full reads as follows. “Walter Lennie Hot Favourite For New Junior Title. In line with England, the NCCU of Scotland has instituted this new championship for Juniors (18 – 21). Among the contenders will be some runners fit to take their place in Senior company as they have amply demonstrated this season. Particularly in this category are Walter Lennie (Vale of Leven), W Williamson (Greenock Glenpark) and Gilbert Adamson (West Kilbride) who, I make bold to say would if they were in the Senior Championship. be in the running for international honours. The brilliant Lennie, sound in stamina, devastating in finishing powers and a stylist to boot, is the form horse to win the title. Adamson, not so stylish, but perhaps more rugged in his make up is a real cross-country type and should at least be a worthy contender.” Adamson’s time was 37:17 against Lennie’s 37:59. However in the National itself Lennie finished second with what some regarded as a disappointing run. Emmet Farrell had this to say: “Adamson Runs Away With Title. Gilbert Adamson of West Kilbride created something of a surprise by the runaway nature of his win over favourite Walter Lennie in the Junior Championship with that grand youngster GL Walker of Edinburgh University a close third. The Vale of Leven boy did not appear to be in the form he was in at the recent Midland Championship, nevertheless Adamson was running so strongly and confidently that he looked as if he could have given most of the fancied seniors a spot of trouble.” He did go on however in April to win the first ever post-war Inter-Counties Cross-Championship. However one of the interesting features of 1949 for me was the absence of Lennie from either of the two Edinburgh to Glasgow Relays held that year and this was to be a feature of his time in the sport North of the Border – a seeming reluctance to turn out in the longer road races. In the May 1950 issue of the ‘Scots Athlete’, Emmet Farrell in looking ahead to the SAAA Championships Walter Lennie in the Mile as a contender for championship honours. Whether he just didn’t run, or whether he ran and was out of the first four, he certainly didn’t make any mark in the event at all, nor although he was eligible did he turn out in the Scottish Junior track championships. Came winter 1950/’51 started with no team from the Vale in the McAndrew relay and there was no Walter Lennie in the teams that finished second and third behind Garscube in the Dunbartonshire event, nor was he in evidence in the Midland District Relay on 4th October. either. Nor was he in the Inter-Counties which he had won the previous December, the Dunbartonshire championship, the Nigel Barge, the Midlands or the National. Where had he gone? The answer came in the July 1951 issue in the reports of the Scottish Senior Championships at Hampden on 23rd and 24th June. Emmet Farrell commented “The surprise of the Championship was the failure of holder Frank Sinclair (Greenock Wellpark) to come through his heat of the mile. “Lack of training,” in his own words was the reason. Diminutive Walter Lennie (Vale of Leven) now resident in Colchester showed his best piece of running to date. He was in grand form and after finally shaking off Tom Stevenson, the young CC Internationalist club mate of Sinclair, he went out on his own to win easily in 4 mins 22.7 secs, the fastest championship time in the post-war period.” Result: 1. W Lennie (Colchester) 4:22.7; 2. T Stevenson 4:25; 3. J Stirling (VPAAC) 4:26.6. The November 1951 issue of the ‘Scots Magazine’ he was rated the top Scottish miler of the year on the strength of the win in the SAAA and as a member of Vale of Leven AAC but in the rankings where he again came second with his championship winning time he was listed as Colchester Harriers. Walter Lennie was a very good athlete indeed. We started this profile in November 1948 and in that time he had won a first and second in the SAAA Mile, won the first post-war inter-counties cross-country championship, had a first and second in the Midlands Championship, a second in the National Novice and a second in the National Junior cross-country. All that plus a host of excellent short relay performances. There is little doubt that he could have been one of the best ever Scottish distance runners had he not gone south. Willie Gallagher was the team manager’s dream athlete. He ran – and ran well – in everything: he ran in county relays and championships, in District relays and championships, he ran in the National Championships and in the Edinburgh to Glasgow and he ran on the track, on the roads and even in the Ben Nevis hill race. And he never seemed to miss big chunks of time because he was injured either. He was very unfortunate not to have been selected for the Scottish cross-country team just missing out twice when he was ninth. Part of that problem of course was the shortage of international fixtures in the post-war period when there was really only one fixture and another reason was the very high quality of all of the athletes around at the time. We should however have a look at his career to get an indication of how good he was. If we take the Edinburgh to Glasgow Relay as a measure of his consistency and ability over a period we get the following table. In the Edinburgh to Glasgow the toughest two stages are the second of six miles and the sixth of seven miles. He ran both twice and had a net gain of 10 places. In fact it should be noted that he did not lose a place in any of the E – G’s he ran, a quite remarkable record. One rule that most clubs observed was that when you found a stage that particularly suited a runner, you kept him on it and his six runs on Stage Seven tell their own story: two second fastest times, one third and one fourth. His best run in this event was certainly the Stage Two in 1950 when he picked up no fewer than seven places amongst the very best runners in the race and recorded second fastest time of the day. His ability on the roads was not in doubt. If you need any more evidence, then the picture above, taken from the October/November issue of the ‘Scots Athlete’ in which there is a glowing tribute to Willie Gallagher – the five races were the Largs 13 miles, Shotts, Helensburgh 14 miles, Milngavie 10 Miles and fastest time in the Vale’s own sports over 14 miles. More about this article below. One of the difficulties in profiling a runner’s career is the restriction imposed by the information available. The individual races above are not covered in the text of the ‘Scots Athlete’ for instance, and there are times when the first runner for a club is given but thereafter there are only positions gained by the club with no names attached eg on 22nd November 1947 in the National Novice the team result was printed as “W Lennie 2, 27, 52, 68”. So with these limitations in mind, and the 1946 results above, the information we have is as follows. 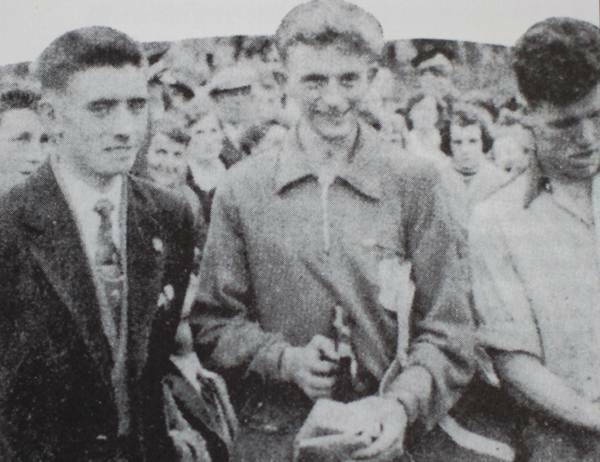 The Vale of Leven had three teams forward in the McAndrew Relay on 3rd October 1948 with the first team consisting of Willie Gallagher (16:32), Andrew Campbell (16:51), F Lacey (17:24) and W Lennie (16:02) fifth. Two months later in the Midlands Relay the club was again fifth with the running order Lacey (16:05), H Coll (15:32), Gallagher (15:21) and Lennie (15:17). After the New Year, on 5th February, in the Midlands 7 Miles Championships, Willie Gallagher was fourth finisher only 32 seconds behind the prodigiously talented John-Joe Barry. The team was eleventh with Gallagher, T Wilson 67th, D Macpherson 75th, A Campbell 76th, W Crowe 86th and A Murray 129th. All good results but there was no team in the National although Willie Gallagher had a very good run against the best that Scotland had to offer in finishing eighteenth supported by W Gardner (118th) and M Connell (129th). In May ’49 there was the first post-war Edinburgh to Glasgow and the Vale of Leven team won the medals for the most meritorious unplaced performance. These medals were as highly prized by most clubs as a medal in any of th other winter championships. The decision was not taken lightly and all steps were taken to avoid bias: the commiittee taking the decision in this race was composed of E Riley, J Binks, (News of the World), DG Wilson (former international athlete and sports reporter), A MacFie, AF Neilson, J Gilbert, G Dallas, D McSwein, DM Wright, W Carmichael and the race referee JC Scott. These were all noted officials – Dunky Wright needs no testimonial, Duncan McSwein was a top official in the SAAA for decades, George Dallas was the man responsible for the resurgence of Maryhill Harriers after the war, a respected track official and holder at different times of the top positions in the sport. So the award had to be merited to get past such a scrutiny. Willie played his part in running possibly the toughest stage of them all, the long Stage Six which started at the Forestfield Inn and went steadily downhill through Caldercruix, Plains, Clarkston, Airdrie with the changeover at the War memorial on the western outskirts of Airdrie. Alec McDougall on the fifth stage had the third fastest time when pulling the club up to eighth and Willie consolidated this position. Into the summer and there are no reports of him racing over the summer of 1949 although such a prolific racer must have compete in many and done well because in the ‘Scots Athlete’ preview of the winter season 1949/’50 he was given special mention as a “bright young man” by Emmet Farrell in his running commentary. The traditional first race of the winter, the McAndrew Relays, was on 1st October and Willie Gallagher ran the second stage for the Vale team that finished eighth. The team in running order was D Macpherson (16:47), Willie Gallagher (16:37), W Crowe (17:07) and Alec MacDougall (16:35). The fastest runner in the B Team was T Wilson in 17:49 so it was the best team available on the day. Two weeks later and it was the Dunbartonshire county 10 miles cross-country relay championship and the Vale team, with Gallagher, McDougall and lennie running won by almost a minute from Clydesdale Harriers. Lying second after the first stage, the Vale had Gallagher second and the report says, “The county road champion Willie Gallagher (Vale of Leven) was in fine fettle and passed the 1947 National Youths Mile Champion Bobby Smith (Garscube) to give his club the lead.” George White (Clydesdale) pushed the Vale (MacDougall) back into second before Lennie took them to the front again. Gallagher had third fastest time of the day with only three runners being inside thirteen minutes. The Edinburgh to Glasgow was on 21st November and it was to hold this ‘third weekend in November’ slot for the remainder of its existence. Again Willie Gallagher was on the sixth stage and held his place (fifth) with the fifth fastest time of the day. In Emmet Farrell’s preview of the Scottish National in the December 1949 ‘Scots Athlete’, he says in one sentence – “Versatile Bob Climie (Bellahouston Harriers), Clark Wallace (Shettleston), J Ellis (Victoria Park) a great little fighter, sturdy Willie Gallagher (Vale of Leven) are others who if they produce the same form over the longer stretch could quite easily make the grade.” Make the grade is interpreted as ‘get into the Scottish team for the international.’ There only was the one international every year and only eight men were selected for it, so it was really difficult to win a ‘jersey’. Willie was mentioned several times as a contender but was unlucky not to do quite enough to gain selection. On 5th December ’49, the District Relay Championships were held at Coatbridge with 37 teams starting. The Vale of Leven was third and picked up the bronze medals to go with the Novices championship golds in 1946 and the most meritorious medals in the Edinburgh to Glasgow in 1949. On this occasion they had D Macpherson on the first stage (15:08), Gallagher on the second stage (14:30), MacDougall (15:01) on three and Lennie (14:10) on four. The report by Eddie Taylor commented on the second stage “As often happens in relays, the second lap saw a change with Shettleston through Clark Wallace taking the lead followed by Vale of Leven, W Gallagher taking his team from 9th to second place.” The fastest times for the day are of interest: Fastest: A Forbes (Victoria Park) 14:09; 2= T Tracey (Springburn) and W Lennie (Vale of Leven) 14:10; 4. B Bickerton (Shettleston) 14:20; 5, 6 and 7: C Wallace, W Gallagher and J Ellis 14:30. The quality behind Gallagher that day was high and included such as Emmet Farrell, George Craig, Alex Kidd and many others. Eddie Taylor’s comment was “This was a grand showing by the Vale lads.” Behind them were Maryhill, Bellahouston and Springburn Harriers. In the February issue, Emmet Farrell picked his own first eight for the National Cross-Country Championship and then listed the chief dangers to the first eight to be Ben Bickerton (Shettleston), Tom Tracey (Springburn), Frank Sinclair (Wellpark and Blaydon), JE Farrell (Maryhill), W Gallagher (Vale of Leven), RF Wilby (Edinburgh University), T McNeish (Irvine YMCA), Alex Kidd (Garscube), Alex Gibson (Hamilton) and Clark Wallace (Shettleston). A long list but every one a quality athlete. In the meantime, before the National, the Midland District Championships were held at Motherwell on 4th February over seven miles. Won by Walter Lennie, in 42:22, Willie Gallagher was eighth in 43:07. Only 45 seconds back and less than 300 yards (maybe 250) behind the winner and ahead of several runners whom Emmet was predicting as first eight finishers in the big one. The team was an agonising fourth with 179 points to Victoria Park’s 162 in third. In the National itself, Willie Gallagher was thirteenth and the club eighth. Now back to the picture at the head of this profile. In the magazine in question there was an article entitled “Ranking Our Road Runners”. I found it particularly interesting in that the magazine had a serious bias towards endurance events but the road running scene was not covered all that well. Results of the principal road running fixtures – if they were less than say 20 miles – were not covered. So the feature immediately captured the interest. After detailing the achievements of the top three (Harry Howard, CD Robertson and JE Farrell) the fourth place was occupied by Willie Gallagher. The relevant paragraph reads. “Being younger in years and experience than the aforementioned campaigners, Willie Gallagher (Vale of Leven) seemed most promising. He took a spotlight with four straight wins (Largs 13 miles, Shotts, Helensburgh 14 miles and Milngavie 10 miles) and fastest time in the open handicap at his own club’s sports (14 miles). In the Milngavie race he had a neck-and-neck struggle with the coming young J Millar (Dundee Thistle). Despite these meritorious wins he tended to be shaded when competing against our top three though he had a victory over Harry Howard at Largs on the week following the Shettleston man’s Scottish triumph and a week previous to his memorable British race.” The top ten were H Howard, C Robertson, JE Farrell, W Gallagher, A Arbuckle (Monkland Harriers), J Lindsay (Bellahouston), H Haughie (Springburn), T McGinley (Garscube), P Taylor, J Paterson. A quite remarkable group! Winter 1950/’51 started with the McAndrew Relay the Vale team was ninth with Gallagher’s 16:25 their fastest time not far behind the eight fastest in the race of 16:12 by Eddie Bannon (Shettleston. In the District Championships at Stepps, he was again his team’s fastest man with 1148 which was seventh fastest of the day and the team finished fifth. On 16th December the Second Annual Inter-Counties Championship was held over 6 miles at Stirling and was won by Ben Bickerton running for Lanarkshire in 35:34 from Shettleston team-mates Clark Wallace (36:08) and Eddie Bannon (36:04) with Willie Gallagher leading the Dunbartonshire contingent home in fourth place. That was the order in the team race too – Lanarkshire comfortable winners from Dunbartonshire. Then on 6th January the Dunbartonshire Championships were held at Dumbarton and Willie Gallagher ran out the winner in 37:31 from team-mate Alec MacDougall in 37:39 and Alex Kidd (Garscube) in 37:52 – 13 seconds between first and third! Vale of Leven were second to Garscube whose counters were 3, 4, 5 and 6. It is a pity that the race was held on the same day as the Nigel Barge race at Maryhill where A Forbes, T Tracey and JE Farrell were the one, two and three. On 3rd February the Midland District Championships were held at Millerston and Willie had a good run to finish sixth ahead of such as Bickerton, Ellis, Wallace, Kidd and many other top class athletes. Again Willie was mentioned by Emmet Farrell in his National preview as being a ‘possible’ for the international team, and he goes on to say, “Chic Forbes, Clark Wallace, Willie Gallagher and Alex Kidd are all enthusiastic and ambitious young athletes, conscientious to a degree and one or more may come near. If they are ever to break through they must surely do so now or in the reasonably near future.”. Whether the words of Emmet Farrell were an encouragement, only Willie knows but in the National at Hamilton on 3rd March, he finished ninth – and usually only eight were selected to do duty for their country. The first ten were: 1. A Forbes 50:08; 2. T Tracey 50:13; 3. CD Robertson 51:24; 4. JE Farrell 51:35; 5. A Kidd 51:47; 6. J Ellis 51:48; 7. A Gibson 51:56; 8. J Stevenson (Springburn) 52:02; 9. W Gallagher 52:05; 10: G King (Wellpark) 52:19. Two of Emmet’s nominees in the first nine isn’t bad and after the race he had this to say, “marathon prospect Willie Gallagher’s ninth place revealed consistency.” The ninth place ensured that he was a reserve for the Scottish team for the international. The 1951/’52 season’s McAndrew Relay saw the Vale of Leven down in nineteenth with Willie Gallagher their fastest with 16:44, a time which did not bother the fast times calculations too much. In the Dunbartonshire relays on 20th October at Westerton, The Vale of Leven were third behind Clydesdale and Garscube and Willie Gallagher had third fastest time when on the last leg. Times were – fastest G White (Clydesdale) 16:08; J Duffy (Garscube) 16:12; W Gallagher (V of Leven) 16:14. There was no Vale team out though in the Midland Relay at Stepps on 3rd November. On the 17th in the Edinburgh to Glasgow he ran the second stage for the club gaining three places in the process. He did not however run in either the Inter-Counties or in the Nigel Barge at Maryhill. The Midland championships were held at Lenzie on 2nd February and there was no complete team from the Vale of Leven although Willie did his usual sterling job to finish seventh – with his only team mate J McNabb in 108th place. No doubt this helped Emmet Farrell to say in his preview that he could name six possibles for the international team but ‘the following’ could scrap it out among themselves for the remaining few places: no prizes for guessing that among ‘the possibles’ was Willie Gallagher. There was no Vale team in action at the National and the magazine gives no results for individuals. At any event he wasn’t in the first twelve. Willie was not mentioned at all all summer, not even in the fairly extended preview for the marathon but when the McAndrew relay came along on 4th October he was there for his club. This time the Bale finished thirteenth and Willie only missed being third fastest club runner by one solitary second. On 1st November in the Midland Relays, the club finished fourteenth and Willie Gallagher was undoubtedly their quickest runner over the course and not all that far behind the fastest half dozen on the day. In the Edinburgh to Glasgow, he brought the team from nineteenth to seventeenth with the third fastest time of the day: this is a very hard feat to accomplish in that you are well away from the men who will normally turn in the fast times and you can’t see the opposition while there is every chance that they can see each other! A very good run and better than it looks. In the Inter-Counties on 13th December, he was almost back to his best with a good fourth place, only half a minute behind the winner. Skipping the Midlands championship, he was again tipped to be in the scramble for international selection along with Clark Wallace, Ian Binnie, the Stevenson brothers and another three or four. Came the National on 28th February and he was thirteenth but in a Shettleston Harriers vest. Confirmation that it was indeed the same W Gallagher seemed to come from the fact that, although his was the second Shettleston vest across the finishing line, he was not a counting runner. But strangely enough there is no mention anywhere of him having switched clubs. His name did not appear at all in the ‘Scots Athlete’ until the report on the National in 1954 when it said: “Congratulations and commiserations are due Willie Gallagher of Shettleston for a grand position which just failed to gain recognition. Better luck next time, Willie!” It also commented on the fine running of Forres McKenzie of Inverness. When we look at the actual results, we find that Forres McKenzie, running for Shettleston Harriers, was fifth and Willie Gallagher running for the same club was eleventh, 38 seconds in front of Emmet Farrell. Neither man was counted in the official results with winning team Shettleston having Bannon 1st, McGhee 7th, Wallace 16th, Eadie 17th, Fox 24th and More 25th. When a runner changed clubs he had to serve a period of time before he could run as a team member for his new club. At one point it was 14 months, at another it was 9 months and at others it was at the discretion of the SCCU Rules and Records Committee. Willie had now run as a non-scorer in two Nationals for Shettleston so his time was pretty well up. “The day was dry, the weather warm, but there was a very stiff headwind which over a very open course was a decided handicap. The Provost of Gourock got the runners off to a very fast start. At four miles, Duffy led with W Jackson, Royal Navy, H Lawrence, Teviotdale Harriers, and Joe McGhee, Shettleston H, in attendance. The time at 5 miles was 27:11 with Duffy, Lawrence, McGhee and G King, Greenock Wellpark, all together. Then came W Gallagher, Shettleston, in 27:29, then a bunch including G Porteous and JE Farrell, both Maryhill H, and AH Fleming, Cambuslang H, in 28:37. It was easy to see that this was going to be a fast race and after the five miles check and the run through Greenock and Port Glagsow, the rot set in for quite a few and there were changes. At 10 miles, Lawrence and McGhee led in 56:27, with Duffy and King together in 56:53. Next was Gallagher in 57:58, then followed Farrell, Fleming and E Campbell, St Mary’s, in 58:06, still good running with such a head wind. Then came the climb out of Port Glasgow with Lawrence still in front and looking very fit with Joe McGhee taking all the shelter he could from the wind. Duffy was now dropped with Gallagher and King labouring behind. Farrell and Fleming further back were running very easily togther. In the long stiff climb out from Langbank a change came over the race. Although Lawrence was leading and still pattering away, McGhee was holding him easily. King dropped Duffy but Gallagher taking a chance, passed King and at 15 miles, Lawrence and McGhee clocked 1:24:21 which was excellent time with Gallagher at 1:1:25:15 but not looking very happy. King clocked 1:25:45 and here Duffy dropped to a walk and then passed the 15 mile mark in 1:26:51. Then that hardy annual Farrell looking exceedingly strong and fit with Fleming in 1:28:50. Joe McGhee after the long climb up from Langbank decided to take the lead – for the first time. As soon as he pushed ahead, Lawrence decided that he had had enough and at once stopped. He said he had felt sick and had no food sincxe breakfast. McGhee with one glance behind him to see what was going on, pushed ahead and covered – alone the next 5 miles in 30:36, which was amazing on his own, and a strong head wind with which to contend. He could have been forgiven had he taken a rest at this period. The holder of the title, Duffy, retired just after 15 miles, he had been struggling for quite a while. At 20 miles McGhee clocked 1:55:57 with a clear lead of over three quarters of a mile. Gallagher came up at 1:58:13 and said he wished to retire but was persuaded to continue. King came up in 1:58:39 with Farrell running very easy in 2:01:16. There were only seven finishers from the 30 starters in a race known as being one of the toughest in the championship series. The first three were J McGhee, RAF & Shettleston, 2:35:22; JE Farrell, Maryhill Harriers, 2:43:08; GC King, Greenock Wellpark, 2:47:04. No more was reported of his activities for the remainder of the summer but he was back in good form for the 1954/’55 cross-country season. In October 1954, the traditional opener, the McAndrew Relay Willie was in the Shettleston second team that finished fourth. The first team won and the runners were, Bannon (15:36), Turnbull (15:59), Wallace (16:00) and McGhee (15:30), the runners in Willie’s team were Cloudsley (16:04), Gallagher (16:13), McFarlane (16:18) and Wotherspoon (16:27). It would seem that the selectors got it right. In the Midlands Relay on 6th September at Stepps, the Shettleston A team won with the B team in third this time. First team times – Wallace (17:00), Eadie (16:51), McGhee (16:40) and Bannon (16:10), and the B team were Gallagher (17:24), Everett (16:56), Cloudsley (17:11) and Fox (17:18). Again the selectors seemed to have got it right (well, apart from Graham Everett!) and Gallagher was establishing himself as one of the top half dozen on both road and country. 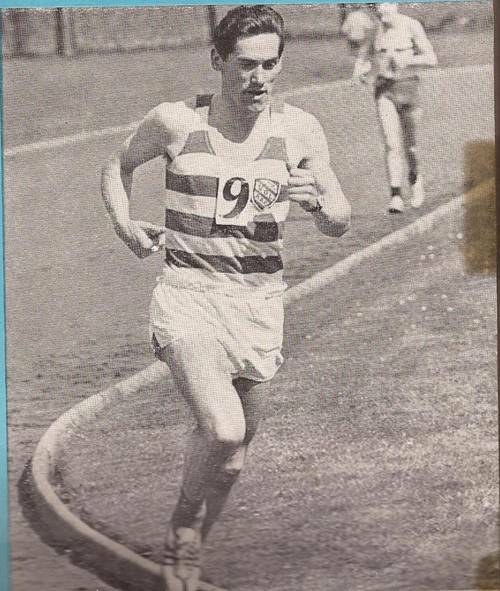 (It is interesting to note that W Lennie ran for the Vale of Leven in the relay but was only third fastest behind P Moy and A McDougall) In the Edinburgh to Glasgow relay in November he was eligible to run for Shettleston and turned out on the seventh stage where he had the second fastest time of the day behind Donald Henson of the winning Victoria Park. Willie took over in second and handed over in second. He was however absent from the Midland District Championship at Lenzie on 5th January and the National Championship on 25th February, 1955. Nor was there any report in the magazine of any outing over the summer. In the McAndrew Relay on 1st October there was no sign of Gallagher in any of the five Shettleston teams forward in the event, and it was the same story in the Lanarkshire Relays on the fifteenth of the month. Then at the start of November, in the Midland Relays at Stepps, the Vale of Leven team finished eighth with a team of R Campbell (14:51), P Moy (14:10), W Gallagher (15:03) and A McDougall (15:03). He was back where he had started with the Vale. In the Edinburgh to Glasgow he was not far from his best when he held the sixth place given to him by Alec McDougall with fourth fastest time of the day. The club won the most meritorious medals that day and Gallagher had won two sets of medals in two years; he had also two sets of ‘most meritorious medals’ since he had collected one in the first relay in 1949. In the Midland District Championships in Lenzie on 28th January, Gallagher was 31st and his club sixth equal with Garscube Harriers. H missed the National as did several other Vale runners and an incomplete team finished with four runners led by Pat Moy in seventh and Alec McDougall in twelfth. His first appearance in the 1956/’57 season was in the Dunbartonshire Relays where the Vale was first with a team of RA Steel, A McDougall, P Moy and W Gallagher, defeating Garscube by 12 seconds. He also ran in the Midland Relays at Stepps where he ran third in the very good Vale team that finished fifth – J Garvey (15:29), A McDougall (14:25), P Moy (13:47) and W Gallagher (14:52), Moy was second fastest on the day. In the Edinburgh to Glasgow, the club picked up to fourth that year with Willie again on the seventh stage where he maintained fourth place with second fastest time overall. Another excellent run. As in the previous year, Gallagher failed to run in the National at Hamilton where Moy and McDougall were fifth and ninth. Unfortunately, this is where the ‘Scots Athlete’ ceased publication so the information for the remainder of Willie Gallagher’s athletic career will be limited by the absence of detailed reports. . In season 1958/’59, in the Midlands Relays, a very good Vale of Leven team was fifth with Robert Campbell (a very good young runner indeed, in 13:54, Alec McDougall in 13:22, Willie Gallagher in 13:59 and Pat Moy, who was really flying at this point, in 12:48. Moy had second fastest time, three seconds slower than Andy Brown and twelve seconds up on Bill Kerr of Victoria Park. The club was eighth in the Edinburgh to Glasgow but the team details are not known. There were several Vale men in the National that year but unfortunately no club team out in the senior race. The runners were Alec McDougall 25th, Jimmy Garvie 55th, Willie Gallagher 61st and H Garvie 117th. In the 1959 Edinburgh to Glasgow there was a solid enough Vale team forward that finished eighth with Willie again on the seventh stage where he was eighth fastest in keeping the club in eighth, and in the National the club only had three runners forward. There was a team out in the Midlands Relays for 1960/61 but the Gallagher running was B for Billy and not W for Willie! It was nevertheless ninth. Nor was Willie out in the Edinburgh to Glasgow later that month when the club was seventh. There was again no team in 1961’s National, Alex McKay and Hugh McErlean being the only men racing in the red and white hoops. In the Midlands Relays there was almost a whole new generation of young Vale men forward in the A Team – Ian Haddow, Pat Moy, Fraser Watson and Lachie Stewart and Pat Moy was the slowest man in the team. Now, in the twenty first century, 37 is not regarded as too old in road running terms although there are many reasons for stopping racing. Many of the top men do not have a serious career in veteran athletics, maybe having worked so hard for a long career they just feel they don’t want to go on, maybe they have absolute standards of excellence that makes them not want to go on and run slower than they once did. Whatever the reason, Willie Gallagher had a wonderful career in anybody’s terms. I did my National Service from 1956 to October 1958. 1958 was the year that Alec MacDougall was second in the SAAA Marathon Championship and ran in the Empire Games in Cardiff. Some athletes are stars immediately they appear on the scene, other have a talent that comes to light after an apprenticeship in the sport. Alec’s career has already been outlined above and in 1956 he was second in the Dunblane Highland Games 14 miles behind Harry Fenion and one place ahead of his club mate Pat Moy. I’ll start this profile in 1957. Alec MacDougall had been in the sport for many years before he became an overnight success. Unlike Willie or Walter, however, Alec and Pat Moy did get Scottish vests: Alec’s was in 1957 when the Vale actually had two runners in the Scottish team for the International. Alec had been fourth in the National Cross-Country Championship as a Junior in 1951 and as a senior worked his way up from 74th (1954), 69th (’55) and 12th (’56) to 9th (’57). It was good enough to win him selection for the Scottish team in the International. It was held over a racecourse at Waregem in Belgium with thirty six natural and artificial barriers to negotiate including a 14 foot stream which had to be jumped. Alec was fifty third and a counting runner for the team. The Vale had two runners in the race and the other, Pat Moy, was the first counter for the Scottish team. It is however as a road runner that Alec will be best remembered and he was considerably good. The Commonwealth Games were to be held in Cardiff in 1958 and like all Scottish road runners he had set his sights on selection. In 1957, in a terrific duel with Cyril O’Boyle of Clydesdale Harriers he took 3 minutes 05 seconds off the course record with his time of 63:48 for the 12 miles+ course and finished only one second ahead of O’Boyle. He also won the Brechin 12 and lost narrowly to Harry Fenion in the Edinburgh to North Berwick. “The Empire Marathon was a triumph of organisation on the Thursday of Games Week at Cardiff, yet no marathon has ever been run under greater difficulties. Indeed it would be safe to assume that the organising committee were entitled to suffer severe headaches for most of the three hours during which the race was in progress, and they are to be congratulated for surviving a strict test of their merit. The day is rapidly approaching when a closed circuit may have to be considered for top-line marathons and drastic measures taken to give the competitors unpolluted air which is as necessary to a finely tuned human body in a test of this sort. But for stern control and the rigid discipline of Police Liaison Officer Mr HF Keene, the 25 starters may well have been severely hindered around a not too easy course which extended ten miles along the main Cardiff-Newport Road and returned along a second-class road running parallel to the outward course. The main road could cope with the heavy volumes of traffic whilst police control kept the extended convoy of vehicles in rear of the main body of competitors, but on the by-road it was a difficult situation when the field became spread-eagled and the spectators and followers were as determined as the runners themselves. The temperature was just over 70 degrees – hot enough but not unbearably hot when encountering a stiffish breeze after the turn at 11 miles. It was 2:40 pm when the field swept out of the stadium into the equally packed streets towards the first sharp gradient of 1 in 18 at 4 miles where no one had tried to make a break. A mile later it would have been difficult to name a purposeful leader when 15 passed in a matter of a few seconds, but for record purposes, Kemball, Davies, Wild and Barnard were bracketed at 26:50. Let me add that all those who finished in the first 15 were less than 10 seconds away. Two miles later found a breaking-up process about to begin and Davies – no doubt inspired by the “Welcome in the Hillside” – forged ahead and took Power with him to clock 53:48 at 10 miles. Barnard was nearby, so was young Peter Wilkinson and MacDougall inside 54 minutes. Then came Keily, Dickson, Franklyn, Kirkup and Sum all inside 56 minutes. The Welsh leader was forced to ease considerably with an attach of apparent cramp and, by 15 miles, had dropped to ninth place. Meanwhile Power had held the pace and reached 15 miles in 1:20:03 with Barnard only 10 seconds away – a distance which scarcely altered throughout the remainder of the race. Kirkup and Dickson were with Barnard at this point while Wilkinson came along with Sum 7 seconds later. Kemball and MacDougall, now half a minute away and equal distance ahead of Davies and Keily. But it wasn’t the Arthur we know and for the moment we thought that “The House of Keily” had sent the wrong boy! Our heartfelt sympathy goes to Arthur who for no accountable reason struck one of these days which do happen to a fellow once in a lifetime. Indeed our sentiments are equally sincere towards the two Scottish boys – Fox and Fenion – and the Northern Ireland representative – Dawson – who had to retire in the later stages of the race. First eight: 1. Dave Power (Australia) 2:22:45.6; 2. Jackie Barnard (SA) 2:22:57.4; 3. Peter Wilkinson (Eng) 2:24:42; 4. Eddie Kirkup (Eng) 2:27:31.2; 5. Gordon Dickson (Canada) 2:28:42.2; 6. Colin Kemball (Eng) 2:29:17.2; 7. Alec MacDougall (Scotland) 2:29:57.2; 8. K Sum (Kenya) 2:30:49.2. They were followed by Rhys Davies and Ron Franklyn (Wales), John Russell (Australia), Arthur Keily (Eng), Martinus Wild (SA), Ray Puckett (NZ. 21 finishers in total. It was a very competitive run by Alec to finish seventh in such company and beat the existing Games record with his time of 2:29:58. Alex Wilson pointed out that he was the first Scot to break 2:30 in a major international competition. This was clearly Alec’s finest athletic performance although he went on running for another five or six years including three Edinburgh to Glasgow relays but he was never ever as good as that very high peak. He came back home and less than two weeks later, showing amazing powers of recovery, won the Strathallan Meeting 22 miles in 1:56:33 from Jackie Foster of Edinburgh Southern who ran 1:57:16. He finished the season with a victory in the Springburn 12 Miles race, one of the four counting races (the others were the Clydebank to Helensburgh 16, the Strathallan 20 and the SAAA Marathon, towards the Scottish Marathon Club Championship. In September that year he was second to Andy Brown in the Shotts 14 miles road race. The SMC championship was no competition that year and to top off a marvellous year he was presented with the Donald Robertson Trophy as the Scottish Road Runner of the year. Alec’s last competitive year was 1962 when he won the Balloch to Clydebank race in 69:53. There were sundry other races such as the Dirrans Sports 13 but this was his only first place that year. A top class runner on road and country with that spectacular 1958 year which was better than anything produced by others who are maybe better remembered than he is. 1956 Ben Nevis: Pat Moy (first), Stan Horn (Garscube, second) and Eddie Campbell (Lochaber, third). Pat Moy had a quite outstanding – but far too short (only about 10 years) – career in athletics. His career has been largely covered by what has been written in the early stages of the club and by results quoted in Willie Gallagher’s section but we really should look at some of the high spots of his running career. His first Edinburgh to Glasgow Relay was in 1954 and it is worth looking at it fairly closely. The basic figures are as follows. No details of team order available, he probably did run and probably on the second. This was the year that there was no runner waiting for Hughie McErlean at the changeover at Forestfield so no team finished. He may have been scheduled for seven or eight. Note that in total he gained a total of 22 places that we know of (there may have been more in 1958) and only dropped two. The gain of ten places in 1956 on Two is amazing but it is usually felt that his best bet was in 1955 when the team won the most meritorious medals. As a record of competitiveness is is notable – even in 1962, on the unfashionable seventh stage, down the field, he ran the fifth fastest time of the day. Away from the international scene he ran in everything – he ran on the hills and he ran on the roads. In 1955 he was second in the Goat Fell race in Arran and seventh on the Ben Nevis on 3rd October. In 1956 he raced a great deal between June and September. He was second in Goat Fell, second in the Dundee 12, second to Joe McGhee in the Aberfeldy 13, son the Bute Highland Gaes 18 Miles on Rothesay ahead of Harry Fenion, won the Ben Nevis by three minutes and was third in the Dunblane Highland Games 14 behind Joe McGhee and Alec MacDougall. The photograph above shows him after winning the Ben Nevis race in 1956 in 1:45:55 from Stan Horn (Garscube) in 1:48:59 with local man Eddie Campbell third. This time stood until 1962 when Peter Hall (Barrow) bettered it by eleven seconds. He also, in 1956, led the first six to break the two hour barrier. He ran in long distance road races such as the Edinburgh to North Berwick in 1958 where he was fifth in the race reported above in which Harry Fenion defeated Alec MacDougall, Hugo Fox with Gordon Eadie fourth in 2:12:54 – Moy’s time was 2:15:22 and he defeated several well-known road runners. In 1958 he was fifth of 38 finishers in the 16+ miles Clydebank to Helensburgh with Harry Fenion winning from Andy Brown and Alec MacDougall. He also finally won the Goat Fell race by almost seven minutes from Eddie Campbell of Lochaber which must be one of his best ever victories. He was second to Hugo Fox in the Aberfeldy 13 and in September was third in the Ben race (in 1:50:53) followed by fifth in a six mile cross-country race at Penrith in a match between a combined Oxford/Cambridge team v Northern Counties v SMC. Pat was the first Scot. In 1959 he was third in the Balloch to Clydebank behind the winner, Alec MacDougall and followed this with a victory in the Brechin 12 and then finished second in Goatfell. Pat also ran on track from time to time but the only National medal he ever won was second place in the SAAA 6 Miles behind Andy Brown in 1958 – 31:10.2 to Brown’s 29:47.6. He was clearly another very talented individual from this still young club. The area of the Vale of Leven, Bonhill and Balloch went on producing many very good athletes but unfortunately for the Vale the club folded up before the end of the 20th century and this local outlet for the talent was not available for them. It would be a pity if the runners were forgotten because the club was no more.